OptiFix's easy exchange design is fully optimised for safe and streamlined inspections, parts removal and service operations. Allweiler, a CIRCOR Business Unit, will be demonstrating its new maintenance solution, the redesigned OptiFix progressing cavity pump and its IN-1000 Condition and Operation Monitoring System at the 2019 Hanover Fair between 1-5 April. Allweiler's team will demonstrate the functionality of the OptiFix by guiding visitors through the five steps to dismantle the pump. The IN-1000 Condition and Operation Monitoring System will also be on display to show visitors how they can improve safety. The IN-1000 is now also available with ATEX certification for EX zones. The Smart Platform IN-1000 series is designed to handle straightforward condition monitoring as well as more complex situations involving multiple pumps. Gunter Connert, director of sales in Germany, said that the reductions to service and energy expenditures pay for the systems over a short period and improve the customer's operating results long-term. The OptiFix progressing cavity pump has a quick-change design and offers the shortest average repair time in its class. 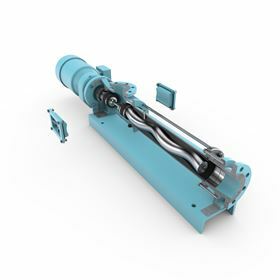 The pump's rotor and stator can be removed without dismantling the discharge and suction casings and the company says it can reduce service times by up to 85%. The Allweiler team will be in Hall 15, Booth G43 at the Hanover Fair.